Helmet or Heels: I'm comfortable in either! I think I originally heard, “The numbers don’t lie” on the Biggest Loser. Sounds like something Jillian would say at a weigh-in. It’s also something that I’ve been wrestling with when looking at my diet and exercise verses the scale. For the most part I eat healthy: low sugar, lots of veggies and fruit, complex carbs, and lean meat. Since the beginning of the year I’ve exercising five to six days a week mostly to prepare for the Color Run 5K in July. You’d think there would be physical changes as a result, but nothing … nada … zilch. So, rather than feel defeated I called in reinforcements. Enter BodyMedia Fit. It is an on-body arm band that collects a bunch of data that you sync with your computer and see the results online. I set-up goals, entered my activity level, and started recording my meals. 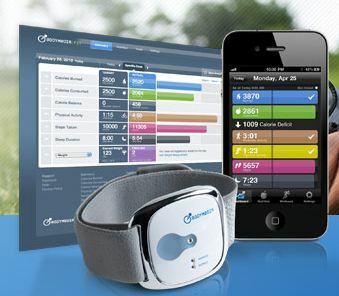 Arm band, computer dashboard, and phone app interface. What a revelation to find out that what I thought was effective aerobic levels only registered as moderate! What?! This arm band is rather accurate so I couldn’t argue with it; I had to increase my workout to get into the vigorous (higher METs) to be able to hit my goals. Well, let me tell you in one week recording and making sure I hit my goals the scaled moved … down two pounds. Yay!! This is an incredible tool if you believe you are doing the right things but nothing is changing like I was experiencing. I want to live healthy and BodyMedia Fit is helping me get there. P.S. I just completed week 6 day 3 of my C25K training. How I think I look and reality! For me, there is so much truth in these images! I’m still laughing. I’m still plugging away training for the Color Run in July. I’m using a treadmill and the C25K app. I’m determined to keep at it no matter what I look like (see above photo). I’m also looking for healthy recipes. Do you have any to share?? Well I’ve gone and done it now. I’ve signed up for a 5K in July. What was I thinking?! First of all, July in Minnesota is HOT. Secondly, a 5K is about three miles and I can’t even run around the block. Thirdly, at my age? Fourthly, did I mention July’s hot weather, I don’t run or jog, and I’m almost closer to 60 that 50? Oy vay. As of today I have 27 weeks to prepare. Theoretically, it sounds like enough time even for a couch potato like me. So where does one start? You download an App! My choice, C25K Pro Guy Hoffman. It takes you from the couch to a 5K in nine weeks. Three days a week it takes you through timed walking/jogging intervals. I’m doing this on the treadmill because it is not the time of year to be out doing this outside. 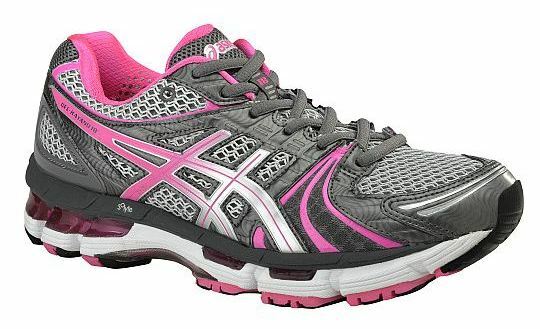 I also popped for a pair of ASICS Gel-Kayano 18 Running Shoes in pink. So now I have a goal with a date, a plan to get there, and shoes! Are you doing anything crazy? My desire of becoming healthier through diet (not starving myself or following fad diets) and exercise can bring undue expectations for results. As I’ve aged I realize I cannot do what I did when I was twenty, at least not right now, but there are things I can do at fifty-something (sigh). My three week powerhouse workouts that dropped weight and re-shaped things all while not changing a thing with my diet just don’t work anymore — age does seem to have messed with my metabolism. Talk about wanting to turn back time — now I have Cher singing in my head — and with her money I could surgically turn back time too! Hum, I think someone needs to reevaluate her expectations. Everyday I need to serve myself up a huge portion of consistency and patience! I may need to be reminded of this next week, but I’m hoping this message sticks to become my great expectation that will result in lifelong changes. What about you? Ever wish you could turn back time and get a do-over? Oh my! 2013 is here and my list of resolutions is still in draft form. 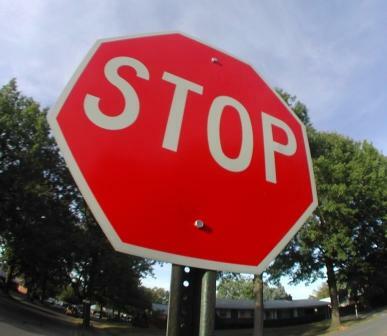 One item that is the typical suspect on a New Year’s resolution list is exercise. The older I get the more I understand the importance of regular exercise. I’m not talking about becoming Ernestine Shepherd, even though I find her story quite motivating, I’m talking about being functionally fit. I’m still working on what that looks like both in exercise and eating healthy. I want to create a realistic plan that will work for me. In the mean time, I found this list of exercises we’d be better off leaving behind in 2013. – Jumping on the bandwagon. – Beating your head against the wall. – Beating your own drum. – Throwing your weight around. Seriously. To me, healthy living is at the center of the target for 2013. I don’t think the rest of my resolutions will be successful without it. I’m not standing still while I figure out what will work best for me. I’m working on doing something that points to my healthy living goal everyday. What plans do you have for 2013? Remember caring about these carbs? A friend of mine had that car. I remember taking it for a few rides. Fast rides! Time to start on that biker body? This got me thinking about riding my motorcycle. Which lead to getting back into exercising and eating right. And then, I found a copy of this diet. A friend received this from a doctor several years ago. The first time I looked it over I thought she was kidding. Believe it or not neither she nor her doctor meant this as a joke. Drink a glass of water 1/2 hour prior to a meal to stretch the stomach, which lowers the appetite when you are ready to sit down to eat. Watch out for the word, BUT, it usually means an excuse is coming. Weigh yourself daily and record it. Continue to weigh yourself even when you get to your “ideal” weight to keep from regaining the weight you worked so hard to lose. You should be able to lose at least one pound per week on this diet. Personally, I have not tried this diet! My friend lost over 60 pounds quite a while ago. She has kept the weight off by continuing to follow this diet! Disclaimer: Try at your own risk. Wisdom would dictate that if you need to lose weight seek doctor’s advice before starting any diet and/or exercise program. What States have you visited?